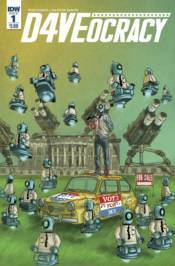 Ryan Ferrier and Valentin Ramon are back with D4VEOCRACY, the third arc of the acclaimed D4VE series. In the wake of a robo-political assassination, D4VE begins a presidential campaign. A hip new app startup has other plans for the robot society, however, and creates the perfect political rival. � From the acclaimed creative team of D4VE, D4VE2, and HOT DAMN!